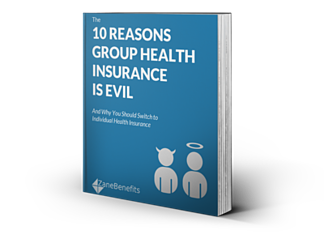 Zane Benefits, the leader in individual health insurance reimbursement for small businesses, announced today the publication of a new eBook, "The 10 Reasons Group Health Insurance is Evil." The eBook helps employers understand what has gone wrong with group health insurance and why individual health insurance is now superior. According to Zane Benefits, millions of working Americans believe that the only way they can get good health insurance is from an employer. Until recently, their belief was accurate. However, in the past few years, a quiet revolution has changed the health insurance options available to employees and businesses: Individual health insurance has become cheaper and better than traditional group health insurance. As companies rapidly begin to cancel group health insurance plans, many are giving all or part of the savings to employees to reimburse them for all or a portion of their individual health insurance premiums. This concept is commonly referred to as employer-funded individual health insurance, or defined contribution health benefits.